As a decorative feature for kitchens and bathrooms there is nothing more popular than wall tiles. Homeowners value wall tiles highly because of their hardwearing properties and aesthetic appeal. 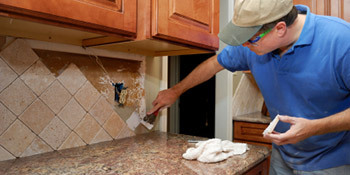 Wall tiles are also very easy to maintain and dirt can be wiped off with a cloth. With thousands of styles and design available to choose from, wall tiles give you the opportunity to create a unique feel to your newly decorated room. Kitchens and bathrooms are rarely seen without wall tiles and it’s now common practise to include tiles in your design. Having something different in the room other than plain walls. Wall tiles take away the bland look, adding a different dimension. And with thousands of styles and designs available you have the possibility of creating a unique look. Tiles will rarely crack and if they get dirty they’re simple to clean, with a wet cloth removing most grime. Plain walls would be harder to maintain and you could need to paint over a stain. Great resistance to impacts and durability qualities. As a decoration, tiles are almost unrivalled in durability and won’t break or crack easily. They’re designed to resist hot and cold temperature too. With kitchens and bathrooms this is incredibly important and with correct grouting water won’t be able to seep through. If one of the tiles does crack it’ll be easy to replace. The old one can be removed and a new one slotted into the existing space. Once grouted it’ll look no different than before the breakage. A friendly gent with good prices. please upgrade your mobile so we can see more images of your previous projects. quick contact, polite, quick quote. We were able to get a quote and find a tradesman quickly. Well... Most builders didn't even know who you are or how you got thier details. Strange no? Was easy and quick to send a request and was contacted by professional and could get the job done rapidly.